This month I was assigned Sew You Think You Can Cook, a fantastic blog full of SO many tasty-looking recipes. One recipe particularly jumped out at me — this Pineapple Fried Rice — because I had fresh pineapple that needed using up, and I *always* seem to have leftover cooked rice in the fridge. I gathered up the rest of the ingredients + got cookin’. And y’all, this might be the most delicious fried rice I’ve ever eaten. The combination of flavors + textures is truly perfect. The sweet, juicy, caramelized pineapple contrasts beautifully with the salty soy, the spicy ginger, and the slightly-crunchy savory veggies. 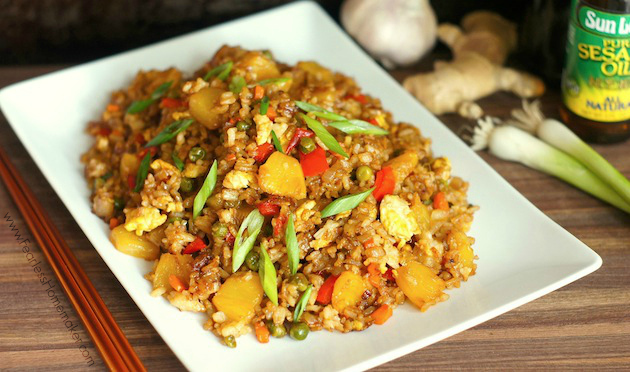 While I usually think of fried rice as a side dish, this is hearty, filling, and well-rounded enough to stand alone as a (meat-free) main dish. If you do prefer it as a side dish, it would work wonderfully alongside Asian-inspired chicken, pork, or fish. 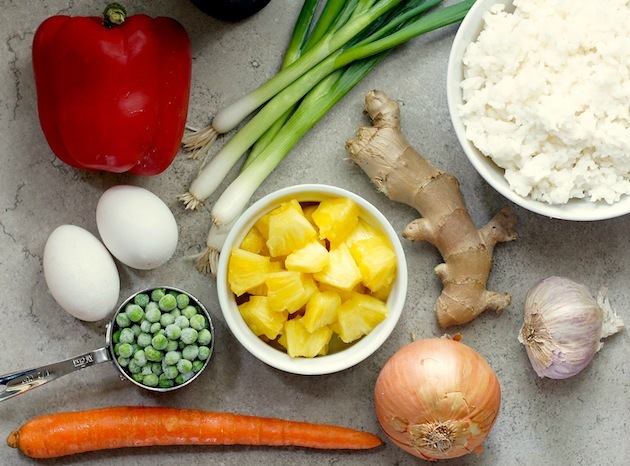 Thank you to Lauren for introducing me to this truly fabulous fried rice + to the Secret Recipe Club for connecting me, yet again, with fantastic bloggers + amazing recipes! For all my previous Secret Recipe Club recipes, click here – there are TONS of awesome ones! In a wok or large skillet, heat 2 tablespoons oil over medium heat. Add the ginger and garlic, and saute for 1-2 minutes, until fragrant. Add the onion and white/light green scallions, and cook for 5-7 minutes, until translucent and tender. Turn the heat up to high, and add in the carrot, pepper, and peas. Cook for 2-3 minutes, stirring frequently – the veggies should still have some crunch left to them. Add in the pineapple, and cook for 2-3 minutes more — pineapple should just be starting to caramelize. Transfer all the cooked veggies to a bowl, and set aside. In the empty skillet, turn the heat down to medium, add the eggs, and scramble. When they’re scrambled, add them to the bowl with the veggies. Add the remaining 1 tablespoon oil to the empty skillet, and heat up to medium-high. Add the cooked rice to the pan, and let cook for 3-5 minutes, stirring occasionally. Rice will begin to brown and get a little crispy. Add in the soy sauce, pepper, and all the cooked veggies and eggs, and cook on high for 2 minutes or so, stirring frequently, until everything is well-combined and hot. Serve immediately, garnished with the sliced dark green scallions and a drop or two of sesame oil, if desired. I have every single one of these ingredients just hanging around right now in my fridge, freezer, and pantry. I think that is a sign that I must make this rice asap! Excellent choice this month!! You MUST, Melissa! It was so wonderfully delicious + I think you would love it! hope you are enjoying your Reveal Day! Yum! 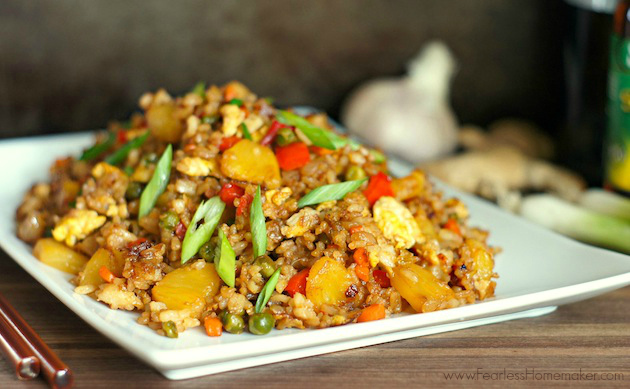 I never would have thought to add pineapple to fried rice, but it looks amazing! I also now realize why my fried rice usually is a bit soggy: because I leave everything in the pan instead of cooking everything separately. Christine, that’s a trick I learned from one of my friends who always makes really amazing fried rice – to cook the different vegetables / meats / eggs / etc. in stages – and it turns out SO fantastic that way! Pineapple and soy are so perfect together – this sounds great! Fab pick this month! Oh my goodness that looks good! I love pineapple in my meals. I am in love with wok cooking! This looks so tasty with so many ingredients and flavors melding together. Wow, what a great idea adding pineapple to the fried rice. Thanks for sharing it this month. Love love LOVE your photo of the ingredients laid out. And your final photo – much prettier than mine. So glad you enjoyed the Pineapple Fried Rice. I have some rice in the fridge right now – I might need to make this for lunch tomorrow! This looks amazing. I make a healthy ham fried rice but will be putting this on my list for summer. Great spin on a classic dish! Happy SRC day and hope you had a happy Memorial Day. looks like a fab version of fried rice! i love it! I am always ready for a good fried rice. This looks delicious. I tend to have rice in the fridge all the time too. I love pineapple fried rice! I always order this whenever I’m in a Thai restaurant! Oh my gosh that looks Ah-maaazzz-ing!! I am so making this soon… yumm!! I was so glad to get to stalk you this past month – I adore your blog! Looks delicious! Love the bright colors! Great pick from Lauren’s blog this month. I think this fried rice would go perfect with roasted pork, it sounds great. Looks really delicious! This dish definitely reminds me of Thailand and the wonderful time I spent there! Yum, yum! I love the addition of pineapple to this rice. It sounds fabulous. Must try soon! This sounds terrific! I often wind up with leftover pineapple too, and this dish would be a great way to use it. OMG It’s been so long since I’ve had rice. I might just have to give in and have some to have this. I love fried rice! The pineapple in there looks and sounds awesome. We made this tonight – it was FANTASTIC!! Awesome recipe, thanks for inspiring. Oh, I am so thrilled to hear that, Rebekah! We LOVED it – glad your family did, too! Looks very colorful and delicious! Great choice for reveal day! I like the idea of adding pineapple to fried rice. It looks so flavorful and colorful and I bet it’s super tasty, too! Wow!! This looks so yummy!! I love that u added pineapple!! So fun! This would make everyone in my house happy! I made this last week and it was great! I’ve tried a few other fried rice dishes and this may be my new go to. I swapped in brown rice and added bbok choy since I had some from my CSA. Thanks for the great recipe! I am SO thrilled to hear that, Laura! This is definitely my favorite fried rice that I’ve made at home, so I love that it now is yours, too. And your adaptations sound wonderful. Thanks for letting me know!